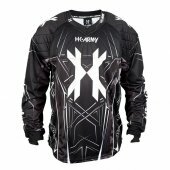 Paintball jerseys are a functional piece of equipment that are designed to keep you comfortable and protected while you play. 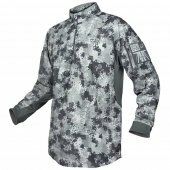 Features vary, but often include padded zones for better protection, ventilation zones to help keep you cool, and non-slip, rubberized areas to help keep your tank from slipping off your shoulder. 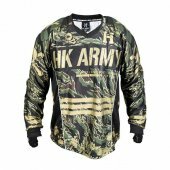 Paintball Jerseys There are 9 products. 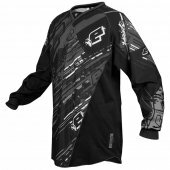 Most players wear their jerseys over-sized. 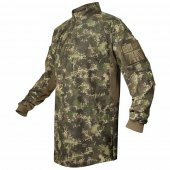 This allows for additional clothing and padding (chest and/or elbow) to be worn underneath, and the extra folds of fabric make it less likely that a paintball will break if it hits. 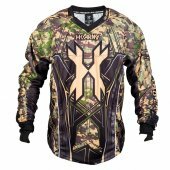 This is why most professional paintball players wear size 2X or larger, even if they would normally wear a medium sized t-shirt off the field.